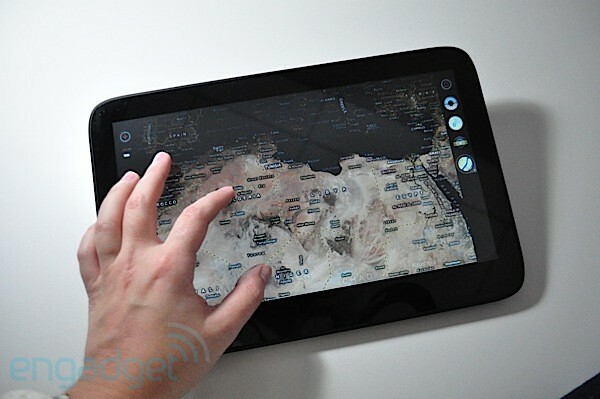 Of all the Atom-powered, Windows 7 tablets we've seen over the last year and a half (and boy have there been a lot! ), the 11.6-inch ExoPC has been the one we've been waiting on. Sure, its specs are similar to the recently reviewed Tega v2 and CTL 2goPad -- it's also got a capacitive touchscreen, accelerometer, Atom Pinetrail processor and 2GB of RAM -- but unlike the others the company has put some serious love into its Windows 7 software layer, which we've dubbed the Connect Four UI. ExoPC's also preloaded the tablet with touch apps, built out its own app store and included a Broadcom Crystal HD accelerator to handle full 1080p video. You can clearly see why we've had high hopes for the ExoPC ever since we got to check it out at Computex, but does it live up to the promise and provide the more enhanced and finger-friendly Windows experience we've been looking for? And is the software stable and robust enough for the average consumer? 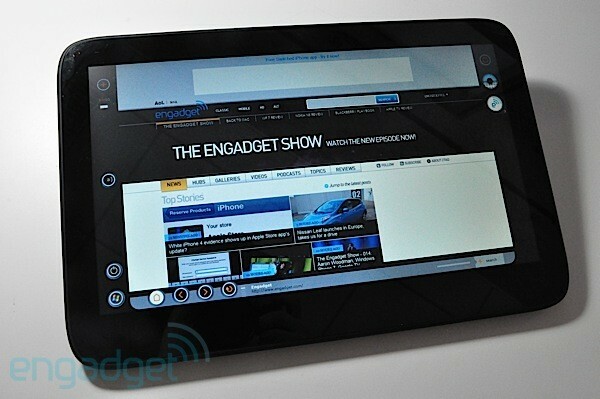 We've spent the last week with the $599 tablet so read on to find out in our full review. How would you rate the Slate? The ExoPC Slate looks a lot like the other tablets roaming around the world -- especially the WeTab, since it's based on the same design by Pegatron -- but that doesn't diminish the allure of its simple aesthetic. The edges and back of the rounded tablet may not be built of metal like the iPad or Tega v2, but the rubbery feeling plastic feels smooth and gives it a fairly durable and solid-feeling exterior. Flip on over the tablet and you're greeted by a familiar flush glass screen with an enlarged black glossy bezel. It should come as no surprise that the ExoPC's 11.6-inch screen gives it a bigger footprint than most of the other 8.9- and 10.1-inch tablets out there, and its wider size and heavier weight -- it tips the scales at 2.09-pounds -- are certainly noticeable in everyday use. Unlike 7-inch tablets like the Galaxy Tab or Archos 7, this is the sort of device that's best used with its included stand or propped up against your legs while using it on the couch or in bed. Actually that's exactly how ExoPC is billing the slate -- as a couch surfing device -- and while it may not be your go-with-you-everywhere gadget, we didn't think twice about popping it into a laptop sleeve and pulling it out on the train to watch some videos. The 0.5-inch tablet is relatively thin in comparison to the the other Atom-powered tablets out there, and shockingly it's just .02-inches thicker than the iPad. However, this tablet still makes room for two USB ports, a headphone jack, SD card slot and a mini-HDMI socket. There's also a SIM slot, though our unit didn't have a 3G module. Like most tablets, the ExoPC's 11.6-inch screen is extremely glossy, and though the company claims it has a fingerprint resistant coating, the panel still picked up our prints faster than Sherlock Holmes. 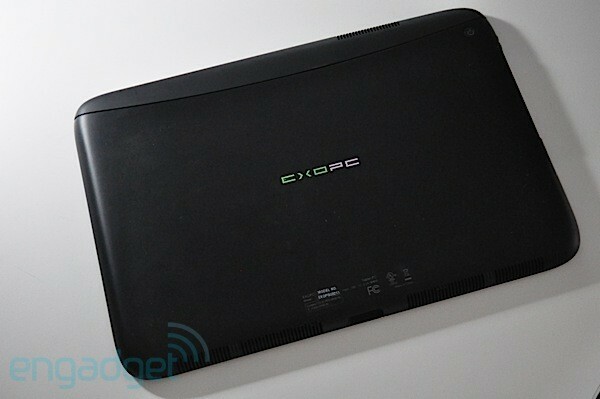 Corny jokes aside, ExoPC does include a screen cleaner and cloth in the box. Beyond the typical glossiness, the display itself is sufficiently bright, and its 1366 x 768- resolution makes a huge difference in comparison to the 1024 x 600-resolution displays we've been seeing on 8.9- and 10.1-inch tablets. Not only is it great for watching 720p content, but it's the optimal resolution for surfing the web in horizontal mode. Speaking of screen orientation, we did find the accelerometer to be slower to adjust than other Atom-powered tablets like the Tega v2 -- it does that quick black flicker thing like all the others, but stalls for about a second longer. However, we do like that there's the ability to turn off the automatic rotation as well as adjust it manually in the preloaded Millennium software program. As for the viewing angles, we have to say it's been much improved since we saw it back in June, but it's still not an A+ -- colors are quick to fade when the screen is tilted off axis to about a 120-degree angle and vertical angles are narrower than we'd like. We were still able to share the screen with a friend while sitting in a small train seat, but clearly the iPad's IPS display has set the bar very high in terms of tablet screens. So, what about the touchscreen performance? We're happy to report we have no qualms about the responsiveness of the capacitive display. As you'd expect, light taps and swipes were all it took to make selections / scroll down pages. If you prefer to give your finger a rest, ExoPC does include a foam-tip capacitive stylus, but we didn't have much luck using it to accurately write in the Writing Pad panel -- like all of these styluses, it's better used for navigating tighter menus than for inking. Along the top bezel is an ambient light sensor, which we actually chose to disable (we're brightness control freaks, okay? ), and a 1.3-megapixel webcam. Oddly, there's no included software for snapping pictures, but we downloaded Skype and enjoyed a lovely chat with a family member. The two speakers on the bottom edge of the tablet are surprisingly loud, but listening to Katy Perry's "Teenage Dream" at full blast was annoyingly tinny. We've spent the last three Windows 7 tablet reviews lamenting about the lack of finger friendly software in Microsoft's desktop OS, but ExoPC gets what the others don't: it's the software, stupid. 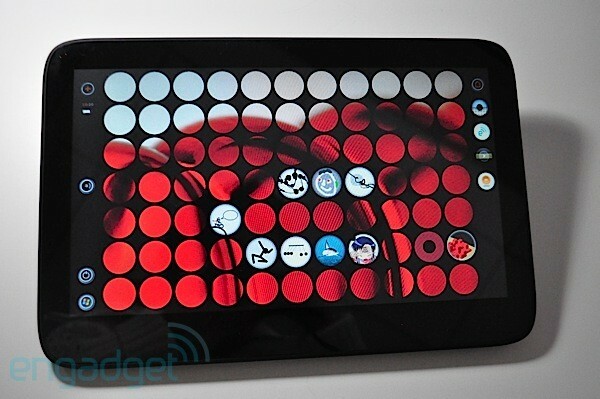 For those unfamiliar with the company's unique software layer, the polka dot grid or Connect Four-like ExoPC UI was built on native code and HTML to provide an alternative operating environment and not tax the CPU too much. And before we dive in deep into the functionality of the overlay, we can report off the bat that the layer is much snappier than the others we've seen -- including CTL's QuickBits and Thinix. You don't have to wait as it transitions to another panel or twiddle your thumbs as it attempts to open an application. ExoPC set out to design software that was extremely easy and intuitive to navigate with a finger, and it certainly accomplishes that task. The grid of icons / shortcuts is straddled by two columns of basic controls, which includes a home button, Windows icon to take you back to the desktop, application store, and power button to shut off the layer altogether. Launching one of the applications or folders on the grid doesn't only launch said app or folder on the center of the screen, but also displays a small circular icon on the right side. You can then toggle to different applications within the UI by hitting the little circles or close a specific program by sliding the icon off the right of the screen. It may seem a bit complicated, but it really becomes second nature and it's truly finger-friendly -- for instance, it's much easier to close apps by sliding a finger than by hitting a small X at the top of a windows. However, while the framework of the UI works quite well and is stable, it only takes a few minutes to realize that the software is still very much a work in progress. However, while the framework of the UI works quite well and is stable, it only takes a few minutes to realize that the software is still very much a work in progress. For instance, there's a keyboard button which brings up a well-designed soft keyboard, but you can't actually input text with it yet. (For now there's the Win 7 keyboard, which pops up in text fields within the layer.) And while you can rearrange the circular icons on the grid you cannot add new ones at the moment -- so there's no way to add a web shortcut or create a new folder. There's also no general settings area for adjusting the volume or brightness so you've got to toggle into Windows every time you want to make a quick change. That's not a big deal since there is a Windows button and you do have a full version of the OS underneath, but we wish there was that basic functionality in the layer itself. The list could go on and on (and it will in the coming paragraphs), but we should state that ExoPC is well aware of all these missing features -- actually each one we brought up was on the known bugs list they sent us -- and it plans to roll out updates that include fixes for each of them in the next couple of months. It should also be noted that the ExoPC is really aiming its branded slate at early adopters and developers -- the company will be working with partners in different areas (Ciara in Canada, Probitas in Europe) that will re-brand the tablet and ship the tablets with close to final software. Instead of just launching Internet Explorer, ExoPC relayered IE8 with its own controls. Now, we'd be totally okay with that if the remodeled browser was fully baked and well, if we didn't have an intrinsic dislike for IE8 to begin with. We found browsing to be slower than Firefox and Chrome, and though it's multitouch capable, it just feels more sluggish than competing solutions at opening pages and scrolling. In addition, you cannot add tabs for now or, as previously mentioned, save bookmarks to the main grid. ExoPC is working on those things as well as the ability to embed other browsers in the UI, but for now you're stuck with a very gimped version of IE8 within the Exo layer. We ended up tapping the Windows button, launching Firefox from the desktop, and surfing the web the way we've become accustomed to on Windows tablets. The layer doesn't come with its own dedicated media player per se, but you can browse through the files on the 32GB SSD (it doesn't read the SD card yet) using a very basic and raw-looking file browser and then play video within it. 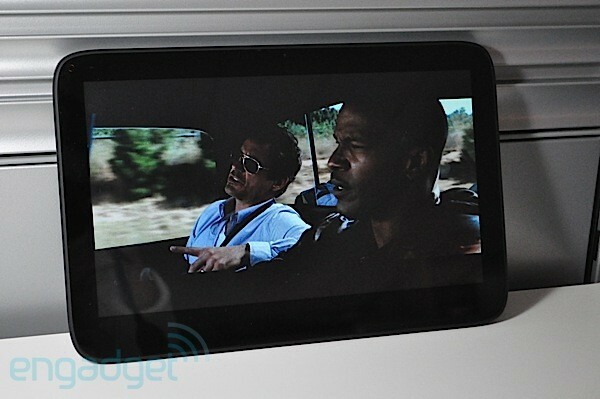 A 1080p trailer played extremely smoothly (thanks Broadcom! ), but missing are some core controls, including an all-important volume toggle. We should also note that the file browser doesn't open photos yet -- it will display thumbnails, but you cannot open enlarge them. While the browser and media player are half baked at this point, we do have to say the preloaded touch applications are a real step in the right direction, and let us do more with this Windows 7 tablet than the others we've played with. (We've said time and time again we wish there was a centralized Windows 7 app store or more touch apps for this Microsoft OS.) Our ExoPC came preloaded with Games, Education, Books, Tools, and Music folders, and each of them was stocked with a variety of applications, all which will eventually be available through the ExoStore when it launches sometime later this month. The apps range from everything from Flash games, Bing Maps, sample books, and useful tools like a calculator or stopwatch. Below is a video demo of some of the apps we've come to know and love over the last couple of days. As we mentioned in the video, a number of the Flash games are sluggish, but most of the doodling and art applications were quite responsive. The Silverlight demos did seem to run smoother, and the company tells us a number of apps are being developed on Microsoft's platform. Obviously, those are the big issue facing the ExoPC right now -- content, apps and development. And though the company is working with publishers and rolled out an SDK back in July, at this point there are no well known apps, games or books to be found. As it stands the ExoPC layer is an extremely nice looking and performing piece of software, but as we've repeated throughout this section, its just not done at this point and missing some badly-needed components that we'd require for day-to-day use. The tablet's 1.6GHz Intel Atom N450 processor, 2GB of RAM, and 32GB SanDisk SSD all provided a fairly snappy computing experience. And as we said earlier, we didn't encounter any real performance issues within the ExoPC UI -- although we did find Flash games to slow things down quite a bit. Sill, it was fine for running multiple applications within the UI as well as within Windows 7. The tablet is also equipped with a Broadcom Crystal HD accelerator, which makes all the difference when playing local and streaming 720p and 1080p video. 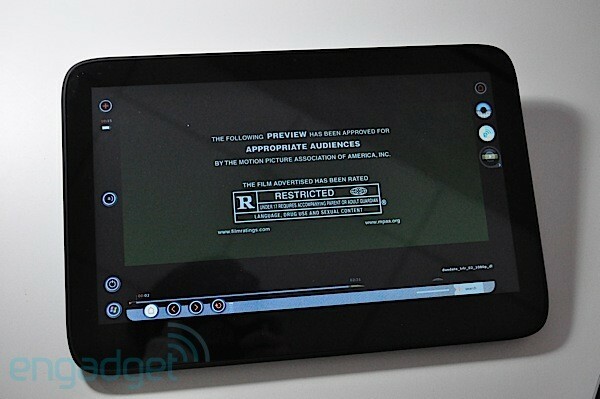 A 1080p Due Date trailer played back without a hiccup in ExoPC's media player, and though we're not sure how practical it really is, it also was able to output it to a 32-inch HDTV with a mini-HDMI cord. Now, officially hook this thing up with WiDi and we'll be all ears! We wish that the good news could continue, but those that have followed the Atom-powered tablet space with us know that we don't have much hope on the battery life front, at least not until Intel's Oak Trail arrives in Q1 2011. The ExoPC slate, like the others, didn't last longer than four hours on our video rundown test. In fact, the unremoveable three-cell battery lasted only three hours and 26 minutes while looping the same standard definition video at 65 percent brightness. When we used the tablet just to surf the web and play some games we got closer to four hours of battery life, but no matter how you slice it, the ExoPC is another Win 7 tablet that's inseparable from its AC adapter. If it weren't for the promise of the ExoPC software layer, we'd probably write this tablet off like most of the other Win 7 slates we've seen. However, it's hard to overlook the totally unique interface and preloaded applications, as they significantly improve the Windows touch experience in a way that is unmatched by any other Windows tablet we've seen. With that said, $599 is a lot of money to bet on a platform that isn't ready and a piece of hardware that must be plugged into the wall for the better part of the day. The ExoPC may be a solid choice for developers and early adopters looking to tinker, but it's just not a mainstream consumer tablet... yet. Editor's note: We will continue to update this review as ExoPC rolls out software updates.